At Mamiba, we make sure that each and every product we deliver from our plant meets the trust of your guests. We source the finest ingredients from world renowned suppliers to offer you only the best. 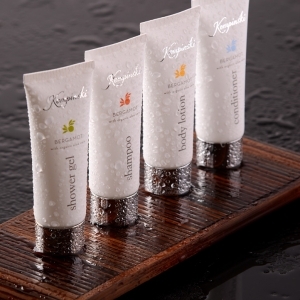 International brands have trusted Mamiba as the supplier of choice for their amenities. We produce the following selected brands exclusively for their designated international hotel chains. For more options, click here. Mamiba offers you a variety of ready-made options at no minimum order quantity. Try our luxurious Acqua Di Portofino for a fine royal touch for your special guests or our Mandarin Green Tea collection for a refreshingly energizing shower your guests will remember you for long after. Our ready-made solutions are complete lines including all the bathroom and guest room accessories as well as presentation items such as special soap dishes and trays. At Mamiba, customization options are limitless. 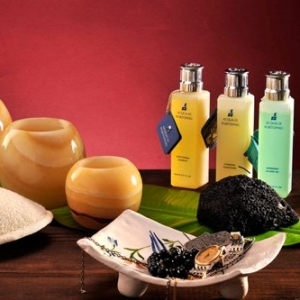 For us, it’s not only about the colors and finishes of our packaging, but the formulation of our amenities. We offer you a variety of options from classic solutions to highly sophisticated handmade gourmet-like creations, integrating the finest essential oil blends. Eco-friendly, Organic and Vegan options are always possibilities at Mamiba. 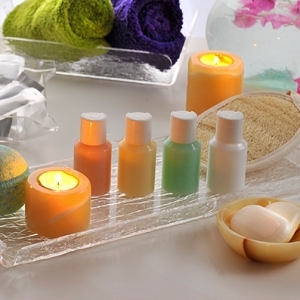 Our customized products are not just amenities, but also accessories, art pieces and more. Find out here. Mamiba manufactures a wide range of accessories from shower caps to vanity kits, from slippers to shoe mitts to dental and shaving kits. Our loofahs are guest favorites, made of premium materials and Egyptian cotton. In addition to the accessories, our Coccinelle line offers a multitude of options for amenity and accessory product presentation, from trays to soap dishes to tissue both covers and more. For Environmentally friendly properties, we do offer eco-friendly solutions for the packaging as well as the products themselves. Want to develop your own line? Contact us today and let one of our representatives guide you through the process.